Cultural Compulsive Disorder: Wolf Creek 2... Electric Boog-a-loo? Wolf Creek 2... Electric Boog-a-loo? The Australian outback is a lonely, isolated place—the perfect playground for a sadistic serial killer with a penchant for bloodthirsty sport. A red wasteland, the stifling, oppressive heat isn’t the only menace that should be feared. Bored with the so-called commercial tourism of the city, young and idealistic backpackers Rutger and Katarina yearn to explore the “real” Australia and travel to the hauntingly beautiful but desolate Wolf Creek National Park. Far from civilization, the breathtaking vistas and vast open spaces belie a danger lurking in the shadows. Psychopathic pigshooter Mick Taylor is the last man any outback traveler wants to meet and now his irreverent attitude towards human life has escalated to a sadistic new level. 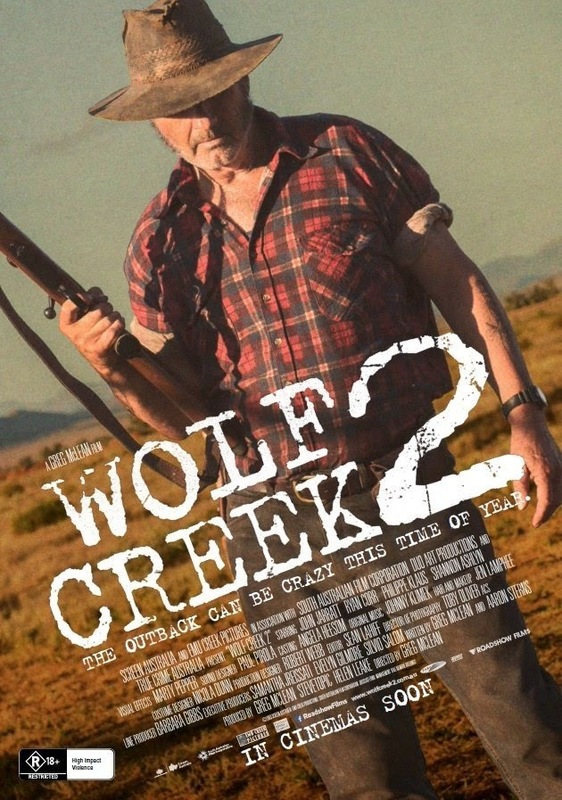 Wolf Creek 2 will have your pulse racing. Paralyzed with fear, we all bear witness as Mick offers no mercy to his victims. Now this is where I do see possible potential. I like that they didn't ADD victims, which is the usual MO of a horror film. Three people were terrorized by Mick in the first film... and that would usually mean that there would be NO LESS THAN 10 VICTIMS in the sequel. But McLean has only gone with what seems like two main targets in WC 2. That is great. Also, this may be McLean's Evil Dead 2, in the sense that Sam Raimi was a young, inexperienced director with a tiny budget & some great ideas when he made Evil Dead. But when it was successful, Raimi decided to basically 'Do Over' the original movie in Part 2, just add more to the story through additions to the budget and having more filmmaking help from the studio. He basically just fleshed out the first film, instead of making a totally original sequel. And it worked... well. McLean has only made one other movie (Rogue in 2007) besides Wolf Creek. And I am sure he knows he has a classic character on his hands in Mick... so he doesn't really want to waste him. This is his shot to make a tighter film, a deeper character study of Mick, and something that feels a bit more personal and fulfilling of a film. I can only hope this is the case. The movie was released internationally last summer, but it gets a statewide release on May 16th, 2014. It will be release VOD and as well get a limited theatrical release. I will be checking in on it... how about you?? ?